NextA history of the First World War: No.8 Der Kriegsherr von 1914 (Part 2 of 2). The inspiration for the following article came about looking at old b&w photographs of Hollywood starlets. Two actresses in particular caught my attention, Marlene Dietrich and Katherine Hepburn because of what they were wearing in the photographs – trousers! So began my quest to find out more. There will always be an exception to the rule, with so many different cultures around the world, about how women are allowed to dress. Women today can wear almost pretty much anything that they like including trousers, though I guess that this is more the case in western cultures, where its acceptance has slowly grown over the last hundred years. However, there is some evidence that points to Eastern cultures, where trousers were first worn by both men and women long before Western cultures did. 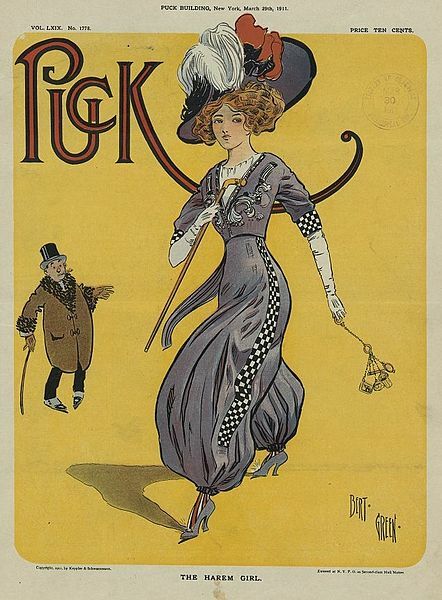 Throughout history, men and women have dressed distinctively different from each other. There have always been rules, some legal and others unwritten, that has helped guide dress codes according to gender. In my humble opinion, women have had a pretty bad deal occasionally in what they have had to wear throughout history. Even though women over time have looked elegant and whimsical, many outfits just seemed impractical. Is it of no surprise then that European women of the nineteenth century for instance, came to realize that many of the outrageous outfits they wore posed health risks, particularly those heavy skirts that swept up dirt and rubbish of the streets. The revolution of women’s dress sense came with the first trousers associated with Amelia Bloomer in 1851. I would definitely argue that the “bloomers”, a form of dress and trousers in one, was arguably the start of things to come. Though it wouldn’t be until around 1910 that fashion designer Paul Pioret would free women from the awful constraints of corsets with Harem pants. His inspiration came from Eastern influences. 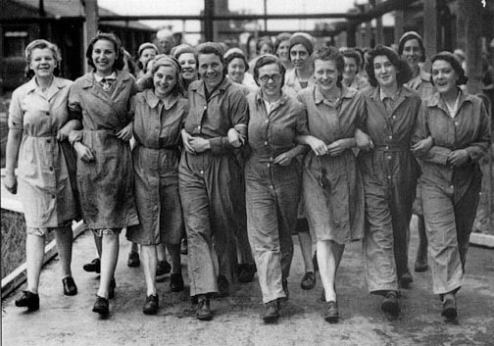 During the First World War women’s trousers came into their own. As women took up the jobs vacated by their husbands, they chose comfort and practicality over style, especially in factory work. Sometimes these trousers were in fact their loved ones or husbands. This revolution was however somewhat short-lived with some restrictions returning in between the war years in regards to women wearing trousers. Many of these rules were legally enforceable but some were also unspoken. Actress Katherine Hepburn broke all sorts of unspoken rules in the Thirties and Forties with her unconventional trousers when women were expected to comfort by wearing skirts and dresses. Studio insiders retell stories how executives once hid her trousers in an effort to persuade her to abandon her androgynous look. She retaliated by walking around the studio lot in nothing but her silk underwear. It worked and she got her trousers back. She was a determined and driven individual, who didn’t often kowtow to social expectations. This steely resistance was not the norm for all women. Many women in the 40’s and 50’s simple still loved wearing tailored skirts and glamorous dresses. Society and men encouraged this stereotype of women. In the 1950’s to the late part of the twentieth century reforms began to take shape and women could wear trousers without fear of ridicule. Though this wasn’t the case everywhere. Our favorite trousers advocate, Katherine Hepburn, was repeatedly asked to wear dresses and not trousers, for example, in smart hotels she visited. Often while visiting her man, Spencer Tracy at Claridges, she was forced to use a side entrance rather than conform to their dress rules. As late as 1966, wealthy socialites were banned from wearing trouser suits in restaurants and hotels too. They were instead asked to disrobe and enter establishments wearing nothing but their long jackets, which often anyway resemble a mini skirt look. Nevertheless, important hurdled continued to be cleared in the trousers acceptance. Some argue that it wasn’t until the sexual revolution and the wave of feminist movements of the 60’s and 70’s that women really took to wearing trousers. In pop culture, fashion icons like Audrey Hepburn in the 1960’s popularized trousers en masse. Notwithstanding the evidence in its popularity, there would always remain a hint of biased or sexism towards women, even as late as the early nineties. For example, it took two US Senators, Barbara Mikulski and Carol Moseley Braun in 1993, to challenge the status quo of Senate dress rules by wearing trousers on the Senate floor, before it was overturned as a mindless rule. Finally, only recently in 2013, a two hundred old bylaw forbidding women from wearing trousers in the city of Paris was also finally revoked. Very good piece. There is kind of a revolution today with pantyhose/stockings. In a professional environment, a woman is expected to wear pantyhose if she is wearing a skirt or dress but in casual environments not so much. The retailers have moved toward the casual side leaving the variety of pantyhose available sparse. Many have adopted the no pantyhose look in business but it is a hard transition somewhat being forced upon us by retailers. Interesting Maryann. Here in the UK tights (pantyhose) are now very much an accessory to dress and as far as I’m aware there’s no expectation that they should be worn with a skirt or dress in a professional environment. They also appear to be a seasonal garment with tights being mostly worn in Autumn and Winter with the denier getting heavier the colder the weather becomes. My grandmother always told me the story of how she used to walk to school and she had to wear a skirt. She lived in New York and she remembers days that were so cold with snow on the ground and she would catch a cold afterwards, every single time because her legs would freeze. There is one movie I’ve always wanted to see (and now really want to see) with Katherine Hepburn that was controversial when she made it in 1935, called Sylvia Scarlett. She played a women disguised as a man. She cut her hair and wore men’s suits. I read that there were people who walked out in the theaters. Thanks for a wonderful and fascinating post! Thank you for your contribution Christina. Sylvia Scarlett is one of those rare films I haven’t seen either. I will have to look it up.